Easter brings to mind eggs, bunnies and loads of fun! It’s the time for merriment, as it celebrates the resurrection of Jesus Christ. While Easter is still a little away, you can never be too early in planning your decorations for the event. Since making the Easter eggs, bunnies and arranging the whole Easter egg hunt requires lot of time and attention, Easter decorations are usually kept simpler and less expensive than the Christmas decorations.Since Easter Sunday also heralds the beginning of spring, flowers which bloom in spring are the perfect way to decorate for Easter. Flowers are cheap, easy to maintain and are brilliant space savers and completely natural and they will tie in seamlessly with your Easter theme! 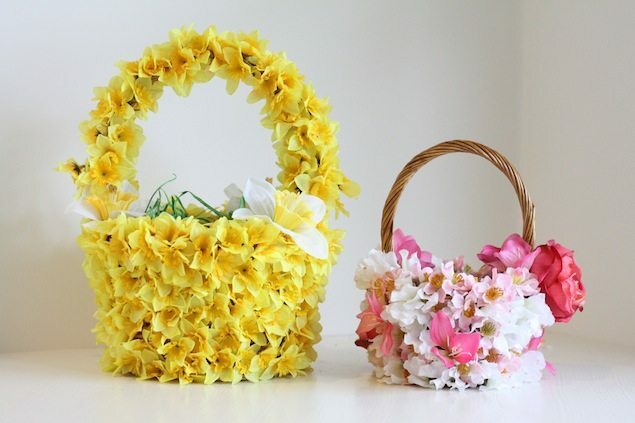 Up your Easter basket’s style quotient with some flowers. This will make your normal wicker basket, look like something out of a fairy tale. 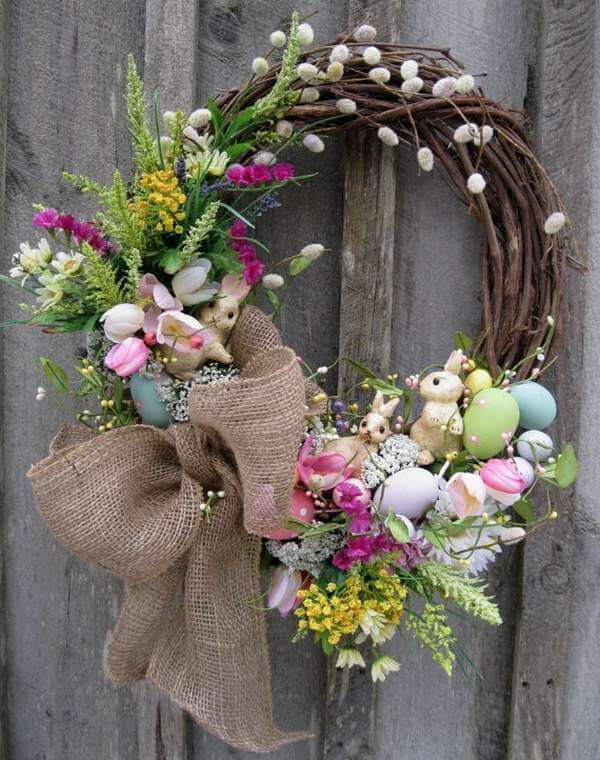 While wreaths are traditionally used at Christmas, there is no reason you cannot make one for your home on Easter. A Easter wreath made out entirely of flowers, will not only look pretty, but also smell awesome and surely impress your guests. For a added touch of fun you can tie in some eggs into your wreath! Easter lunches are a time for friends and families to come together. Add a touch of color to your dining table with a beautiful floral centerpiece. 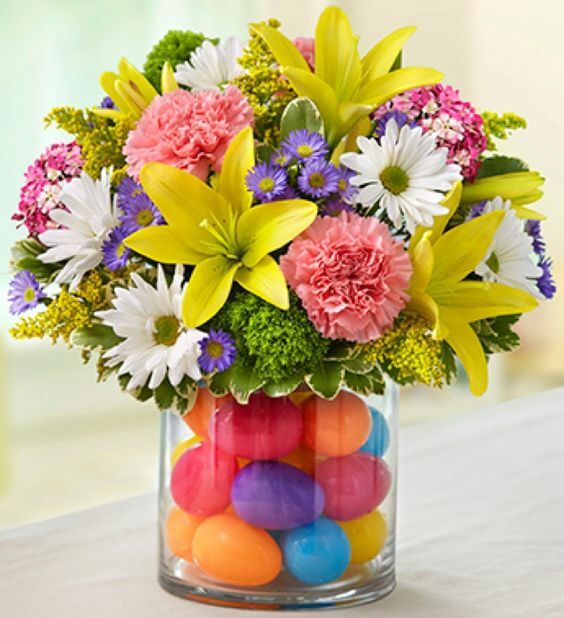 Since eggs are the flavor of the day, you can add some of them into your centerpiece as well! Sometimes the dining tables get too crammed up for a centerpiece. But if your love for flower is strong, you can still bring them into your dining space, by making a flower Chandelier! If you have a Chandelier already in place, add fresh flowers to it, and if you do not have chandelier, then you can create one entirely out of flowers! 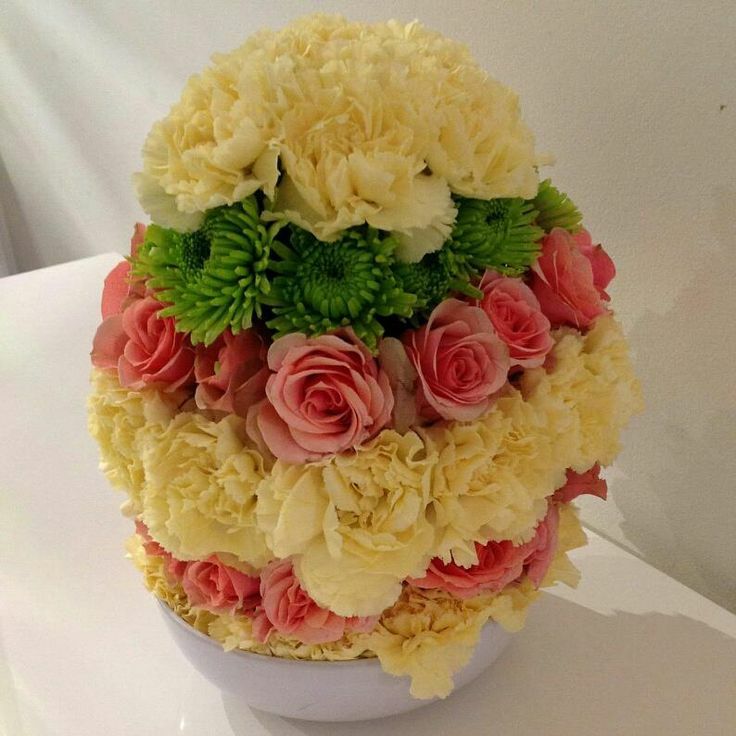 Eggs rule Easter, so how about a Egg made of flowers! You can make as many or as dew flower eggs you like. Hang them across your home, place them on the table, infact you can even add them to the gift basket for your guests! These flower arrangements also add a stylish look and feel to your home. It is a unique and eco-friendly way to decorate your house. Flowers were the primary source of decoration long before there were any plastics or any other decorative materials. Bring them back in style this Easter.